Article within the current edition of the KIT magazine lookKIT on information at the Karlsruhe Institute of Technology, Edition 1/2017. The text was written in English, an excerpt is available in German at the end of the text. The success of a product depends principally on its quality. To assure this quality, manage it and avoid errors, companies must use the appropriate methods and tools beginning as early as the planning phase. Industry 4.0 technologies could help feed data from production back into product development in order to make product development more efficient and take into account customer requirements. “The increasing use of sensors to capture data in real time increases the possibility that future systems requirements can be met as early as during the generation process of new products,” says Sascha Ott, Managing Director of the KIT Institute of Product Engineering (IPEK). The IPEK studies processes involved in the development of new products focused on driving and mobility systems, in an attempt to strengthen the long- term innovative power of German machine and vehicle industries. This gap is addressed by the IPEK in its “IQ4.0 – Introduction of Intelligent Quality Control Systems by Interconnected Value Addition” research project. Together with the International Performance Research Institute gGmbH and the Fraunhofer Institute for Manufacturing Engineering and Automation, it develops specific Industry 4.0 solutions for quality management in small and medium-sized enterprises. The objective is to develop an intelligent set of rules allowing flexible, but also generalized, methods to improve and assure quality in the production process. 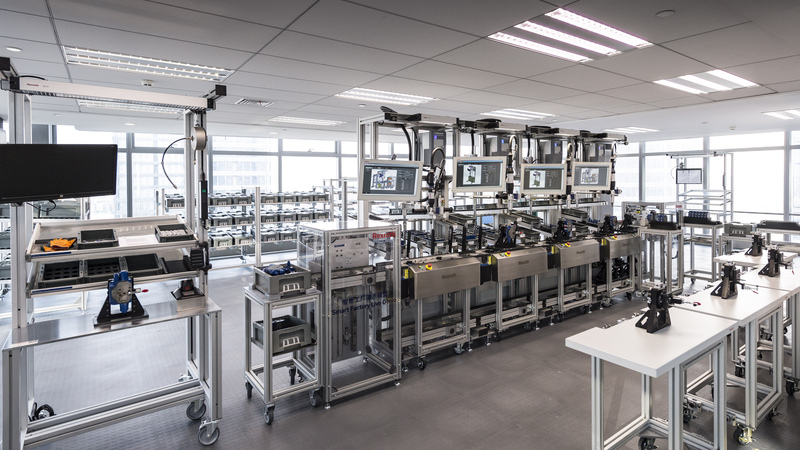 The IPEK contributes its experience in development methodologies to the project and plays a leading role in the development of methods to implement an Industry 4.0-based quality control system. “Our know-how in monitoring the status of technical systems enables us to collect and evaluate quality-related data in a decentralized fashion and initiate decisions,” explains Ott. In setting up a database for a set of intelligent rules, the IPEK first analyzes the systems and technologies used to date by partner firms to monitor and improve quality. This also includes the sensors employed in these systems. Specially programmed selection and synthesis algorithms allow the scientists to reduce to key data the measurement data produced in this way, and to sum them up in a dataset constituting the basis of quality analysis for production processes. The IPEK team includes figures and values not only of in-company players but also of external players, such as suppliers. On the basis of this dataset, the set of intelligent rules serves to coordinate further steps: It recognizes when there is a quality problem at some point, and passes that information on to the relevant staff members. In the course of the project, the system is to be developed further so that it can make decentralized decisions independently on the basis of analytical results, and respond to quality-related influences, such as machine settings, ordering wear parts, or distributing information to the head of production and the product manager. The set of intelligent rules thus is able to recognize problems early and, in a decentralized way, initiate measures with the assistance of the responsible staff members. In addition, it is able to learn from the success or failure of earlier responses and, in this way, improve its performance. Next to data analysis, the IPEK develops methods and tools for ensuring that the quality control system becomes an economically viable proposition for the company once it is introduced. “We expect that the results of the project will entail high user potentials for German industry,” explains Ott. “We want to make methods available to companies which allow them to automatically generate and analyze qualityrelated data.” In this way, users can detect disturbances in the production process at an early point and initiate the appropriate responses. This, in turn, means that companies can increase the effectiveness of the entire plant by continuous improvement. The German Federal Ministry of Education and Research funds the project to the tune of EUR 3.2 million in the “Innovation for Production, Services, and Work of Tomorrow” program. The Karlsruhe Project Management Agency supervises the project. In order to further advance the merger of product and production systems development in a global development environment of Industry 4.0, a consortium of KIT institutes, including the IPEK, is establishing a joint strategic project with several German and Chinese industrial partners as well as Chinese research agencies. The objective will be to develop and demonstrate the potentials arising from Industry 4.0 at an early time and on an international basis. Der Erfolg eines Produktes hängt maßgeblich von dessen Qualität ab. Um diese zu sichern, zu regeln und Fehler zu vermeiden, müssen Unternehmen bereits in der Planungsphase entsprechende Methoden und Werkzeuge anwenden. Industrie-4.0-Technologien könnten ihnen helfen, Daten aus der Produktion in die Produktentwicklung zurückzuführen, um diese effizient zu gestalten und dabei Kundenwünsche zu berücksichtigen. Die Einführung von Methoden und Anwendungen von Industrie 4.0 bedeutet für Produktentwickler einige Veränderungen: Schnellere Prozesse und die zunehmende Automatisierung fordern eine höhere Flexibilität und Agilität sowie entsprechende Methoden sowie Werkzeuge. Denn die Umsetzung von Industrie 4.0 verändert nicht nur die Produktionssysteme, Unternehmen müssen insbesondere die Produkte selber anpassen: Ohne entsprechende Funktionalitäten können die Daten aus der Produktion nicht in die Produktentwicklung zurückfließen. Daher ist es wichtig, zuverlässige und effektive Maßnahmen zu entwickeln, welche die Produkt- und die Produktionsqualität regeln. Diese Lücke adressiert das Institut für Produktentwicklung (IPEK) am KIT mit dem Forschungsprojekt „IQ4.0 – Einführung intelligenter Qualitätsregelungssysteme durch vernetzte Wertschöpfung“: Gemeinsam mit der International Performance Research Institute gGmbH und dem Fraunhofer-Institut für Produktionstechnik und Automatisierung entwickelt es konkrete Industrie-4.0-Lösungen für das Qualitätsmanagement in mittelständischen Unternehmen. Ziel ist es, ein intelligentes Regelwerk zu entwickeln, das flexible aber auch generalisierte Methoden zur Verbesserung und Sicherung der Qualität im Produktionsprozess ermöglicht. Das Bundesministerium für Bildung und Forschung fördert das Projekt mit 3,2 Millionen Euro im Programm „Innovationen für die Produktion, Dienstleistung und Arbeit von morgen“. Der Projektträger Karlsruhe betreut das Vorhaben.